It’s that time of year again! Global Big Day is this Saturday May 5th and we hope you will join us! 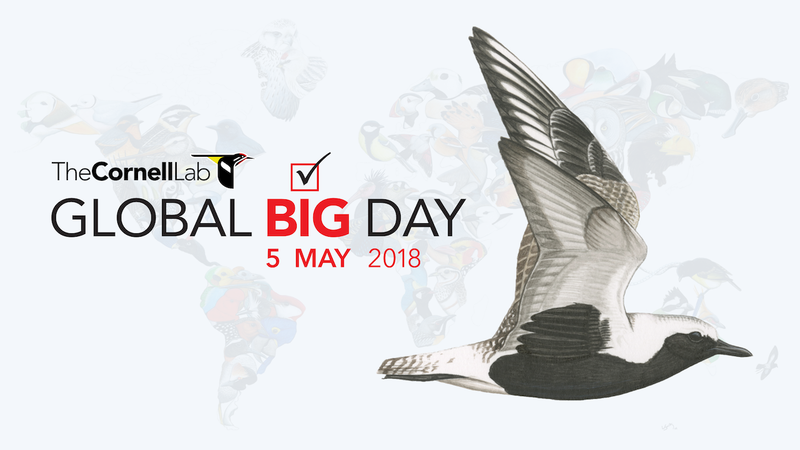 Last year’s Global Big Day featured more than 20,000 people across 162 countries, collectively reporting 6,637 species of birds—more than 60% of the world’s bird diversity. This May, you can be a part of the fun again. All you have to do is spend a few minutes birding, and eBird what you find. “Scout” your birding spots for 5 May. Finding where the birds are ahead of time makes the big day birding more fun, and also gives you more chances to be out enjoying birds. Perfect. Learn how to use eBird to find birds. Use eBird Mobile. eBird’s free data-entry app takes the time out of data entry, with tools like Quick Entry that mean you have less time with your face in a notebook and more time birding. Try eBird Mobile. No matter what you do, have a great time, enjoy the birds around you, and let us know what you find! We’re excited to see what we can achieve together on Global Big Day! Check Out These Live Bird Cams! Spring has arrived across the U.S. and so have nesting birds! With the technology available today, you don’t have to be able to climb a tree to watch the development and progress of birds and their young or to see birds eating from feeders. Several of our SIB members have shared some of their favorite bird cams from their local home states. We’ve included a few additional you might enjoy as well. Take a view and let us know if you have a favorite to share with us. nest site was in the Kodak headquarters tower. When repairs to the tower were needed, the box and recording equipment were moved to a downtown office tower. They have several cameras focused so you can see the nest from multiple angles. To show that nature is not always a success, take a quick look at the live cam of the Bald Eagle nest in Hanover, PA, shared by Bob Worst. Hopefully the pair will have better luck next year. One of our favorite birding websites, All About Birds by Cornell Lab of Ornithology, has a number of great live web cams including Barred Owls, Red-tailed Hawks, wooded ponds and feeders. And the site below will link you to a number of live cams across the globe of not only birds, but animals as well. So take a look at these cams when ever you feel the need to do some birding from the comfort of your home. WARNING: These live cams can be addictive! Author sibirdersPosted on April 22, 2018 Format AsideCategories KnowledgeLeave a comment on Check Out These Live Bird Cams! On March 28, 90 SIB members and friends attended an informative evening program on “Where Have All the Shorebirds Gone?” The program focused on Seabrook Island’s protected shorebirds, threats they face, and what we can all do to help protect them. After social time and refreshments, Aija and Ed Konrad lead a shorebird identification slide show with photos of shorebirds found on Seabrook Island (Ed Aija Shorebird ID SIB Mar 28). Our guest speakers were Melissa Chaplin, Endangered Species Biologist, U.S. Fish & Wildlife Services, SC Field Office, and Janet Thibault, Wildlife Biologist, SC Dept. of Natural Resources. Melissa and Janet are very familiar with Seabrook Island’s critical habitat, and the diversity of shorebirds that depend on our beach to rest and refuel during wintering and migration, or nest in our dunes, or are year-round residents. One of the strengths in the management of the several elements on Seabrook Island is the willingness of hundreds of its property owners to volunteer their time in serving on committees. They choose not to be in the spotlight of elective office. They do the grunt work and fly under the radar. One of these persons is Carl Voelker. Carl’s community activities on Seabrook have been focused on addressing the Island’s environmental concerns. He has been a long time member of SIPOA’s Environmental Committee and part of various task forces and sub-committees therein. One of his early projects was helping to establish sound recycling practices in our community. Currently he is on the SIPOA Planning Committee and has been very active in the successful effort to secure our Island’s certification as an Audubon International Sustainable Community. The boards of both the Seabrook Island Green Space Conservancy and SINHG have benefitted from his participation. A native of rural Georgia, he graduated from the University of Georgia, majoring in marketing. As an enlisted member of the National Guard, he completed US Army MP school at Fort Gordon and had several active duty call-ups while attached to units in Georgia and Texas. Following UGA, Carl began a 35-year career in sales and sales management with Armstrong Cork Company (now Armstrong World Industries). In his initial location, San Antonio, Texas, he met Simone. They will soon celebrate 44 years of marriage. The couple moved to Seabrook Island in 2006, after his retirement, and now enjoy the marsh views off their back deck. One of two adult children lives on James Island allowing him plenty of grandfathering time with his two pre-teen grandchildren. Carl says “I have only an average working knowledge of birds, but am improving thanks to the exposure I’m getting through Seabrook Island Birders. I think most would agree that increased knowledge leads to greater appreciation. While it’s nice to observe a pretty bird or impressive tree, it is more rewarding to be able to identify the bird or tree by name and know something about the species.” He has recently joined the SIB Executive Committee and is focusing on the organization’s participation in various special Island events. Endeavors which have brought him pleasure, beyond work and community involvement, are reading, designing and building tables and chairs, music (he once had a harmonica gig in a duo at Fischers Bar and Grill), and just being outdoors. A current passion is kayak-camping on small Southeast creeks and rivers — 15 different ones since 2004. He can also be found hitting long drives on our golf courses. Some of his furniture pieces are utilitarian (the accompanying picture shows him in an elevated deck chair with built-in foot rest which he designed and built). Others are truly works of art with which they have graced their home. Simone is an impressive artist in her own right with a wide variety of sculptures in wood, metal, marble, and alabaster. Both have exhibited in Seabrook’s art show on annual meeting weekend. Of active people like these two is the enchanting and friendly character of Seabrook Island built and maintained. If you attended either Felicia Sander’s presentation on Red Knots last June or last month’s Shore Bird evening program, you know Seabrook Island is an important stop over on Red Knots migration north. Each year, the South Carolina Department of Natural Resources (DNR) helps in the federally endangered species research by banding the birds as they migrate through our area. The new brochure developed in conjunction with the town, DNR, US Fish and Wildlife and Seabrook Island Birders gives more information. Recently, Felicia reached out to SIB members alerting them of DNR’s plans to once again band on Seabrook Island if the Red Knots cooperated. The hope is to do this sometime the week of April 16. When DNR performs this activity, they need volunteers to assist in the process. The volunteers would be assigned tasks (and trained if needed) of preparing the area for capture of the Red Knots, educating fellow residents encountered during the process, actually “firing” the nets to capture the Red Knots then safely releasing them to holding tents, banding (and recording data) and then releasing the birds back to the beach. If you are interested in assisting in the banding effort, please let us know by completing the attached form. By completing the form, you are not committing to the date since we are not sure when exactly it will be. This information will let us know to reach out to you when the date and time is known to finalize your ability to assist. Thank-you for your assistance and cooperation in conducting research for this endangered species. Meet new and “old” friends while learning about the birds of our island and the Lowcountry by joining us on a bird walk. Walks are generally two hours in length with varying degrees of walking. This month, our “walks” include birding on the deck of Carol King for a “Backyard Birding” of Cap’n Sam’s Inlet. Next we have a walk around Palmetto Lake behind the Lake House and then the Horse Pastures in celebration of Earth Day (about 1 mile). Finally, we will use golf carts to travel on Ocean Winds Golf Course so it is accessible for all! We welcome birders of all levels! Keep watch on our Calendar as we continue to add activities for our members! Also, join our SIB Google Group to receive an email about short-notice bird walks and interesting bird sightings! Events are free for members and $5 for guests. If you are not yet a 2018 SIB member, you may first become a member by following the instructions here.